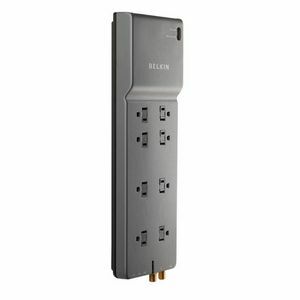 The Home/Office BE108230-12 8-Outlets Surge Suppressor provides premium power protection for both home and professional workstations, and all connected devices. Our decades of research and development have led us to the release of this breakthrough series. We've used advanced design elements, top-quality construction, and superior circuitry and components to provide the most complete protection from power surges, spikes, and AC contamination available. Belkin backs this model with industry-best Lifetime Product and Connected Equipment Warranties. This Home/Office Series model protects professional workstations, laser printers, telephones, home-theater systems, and everyday household electronics. Its slim, sleek design blends seamlessly with today's modern electronics and appliances. This Home/Office Series model features a detachable cord-management clip that helps organize your cables. The second I connected and activated this product, electrons flowed from the wall outlet DIRECTLY into my appliances. Using a Scanning Electron Microscope, I was able to determine that all electrons were making it from the wall into my equipment, a full 121V. I bought mine in 2010. Perhaps they've changed the mold for the back since then to provide more useful mounting holes. A perfectly fine surge suppressor, lots of room for power bricks. Lies flat. Went to mount the surge suppressor on a wall, and found that the mounting holes on the back only allow for mounting the unit vertically, with the cord pointing down. Plus, the mounting holes are not centered. So if a wall is your intended location, this probably isn't the unit for you. The Belkin 8 Outlet Surge Protector was better than we expected. We really like the area underneath it that holds the cords. We also like that it can be elevated off the floor. It even looks professional (for our office). I bought this to provide power to two 6 unit radio rack chargers. I am part of a volunteer organization that requires members to communicate with each other in the field by radio. This 8 outlet surge protector fit the bill. I can't leave an extensive review as I've only tested the outlets and the built in tester for grounding is a nifty addition. It works the way it should as far as I've been able to test and currently have a tv and 3 gaming consoles connected to it. It works. I can't really induce a failure on the surge protector to see if it really protects my electronics, so I have to trust it. Slim design makes it easy to fit behind the desk without creating too much clutter. Cable management clips keeps wires organized and neat. We have loved these - as we have numerous items with large transformers under our desks this allows us to use just one extention cord. Great features! I guess it could have had an Ethernet protector port, but I'm not too worried about the router getting struck by lightning. The cord is plenty thick and long, it is baby-proof without impeding the activities of single adults, and it feels heavy and well constructed. Just an all-around high class piece of equipment that feels like it will stay in the family for generations. The mounting/hanging holes are exactly 1/4" (with an 1/8" slot) so sheetrock screws are a no-go and even pushpins are a bit of a fight if you want to wall-mount the thing. An extra 1/16" would go a long way. If you have several devices with large-blocky adapters. This is a great surge protector, the added cable management is convent but elsewise un-needed.